As many decorators may share, homeowners sometimes have a love/hate relationship with their sliding glass doors. While they are convenient and functional, particularly in the summer with access to a deck or porch, they also can be unsightly and difficult to decorate. The new Deco Tint collection by Wallpaper For Windows was developed to help homeowners and renters renew their love of sliders. 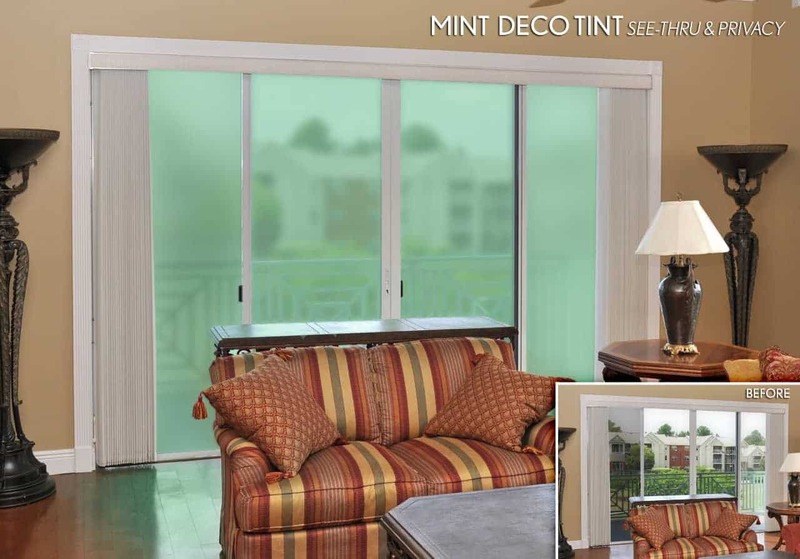 Deco Tint allows you to give any sliding glass door a makeover that enhances the room’s decor. The cure is a dose of color. Adding color to the glass of sliding glass doors is an easy way to transform them into new and stylish doors. Deco Tints can easily give sliders a colorful and complementary new look that combines light and color in a very attractive way. Available in 10 decorator colors, Deco Tints are adhesive-free films that give clear glass the look of stained or colored glass. From light tint colors (sky blue, mint, sandstone and dusty rose) to richer colors (amber, golden yellow, ruby, ocean blue, lavender and spring green), there are colors to complement every decor. Each color also is available in both see-thru and privacy versions. The see-thru versions add color to the glass while softening the existing view. While you can still see outside,Â much of the visual clutter seems to disappear from view or is less intrusive to the room’s ambiance. Privacy Deco Tints have all the benefits of frosted glass, but in decorator colors (frost is also available). Common reasons to use Privacy Deco tints are to reduce visibility into the home, hide backyard necessities (BBQ grills, lawn chairs, hot tubs, etc. ), hide an unappealing view and to reduce the amount of wall space that is see-through. The Deco Tint adhesive-free films are easy to apply, trim to size and keep clean (they resist fingerprints and smudges). Not only will they look great for years, Deco Tints also can be removed in just a few minutes when it is time to redecorate. Additional benefits of the Deco Tint films are saving energy (cooler in the summer, warmer in winter) and UV filtering. Whether you are ready for a new look, need additional privacy or have an unappealing view, Wallpaper For Windows and Deco Tints are stylish solutions that provide great value for your decorating dollar. For more information and to order, visit www.wallpaperforwindows.com. Disclosure: The above post is a sponsored post where a monetary exchange was made.